As a GBC applicant, you are assigned a faculty advisor according to your major (and even if you've not yet selected a major). To learn who your advisor is, log into the MyGBC Self-Service Center. Then click the Student Center button. 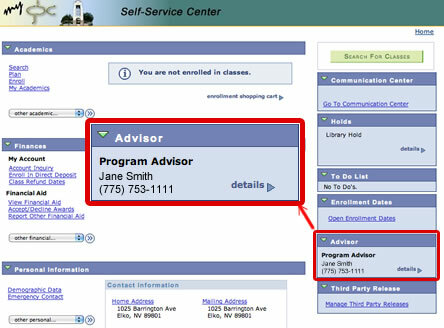 You'll see your advisor listed on the left of your Student Center page. See the screenshot below for the location of your advisor's name. Left-click on "copy email address"
It is up to you to initiate contact with your advisor. If you want to change your advisor, contact the Admission Advising and Career Center or your local campus. You are strongly encouraged to avail yourself of advisement. Your advisor will assist you with class selection to streamline your academic process. It's a good idea to contact your advisor before the enrollment period begins. Faculty return to campus before the beginning of fall instruction to be available to you. You also have the resources of the Admission Advising and Career Center at your disposal. If you are uncertain about what academic objective truly suits you, the center has assessment services to align your academic objectives with your aptitudes and preferences. Counselors at the center are available to assist you with any matters affecting your success at GBC.